Turkey Picadillo is a lightened up version of the traditional Latin American dish made with ground beef. Serve it over rice or as a taco filling and enjoy! This recipe for turkey picadillo was inspired by a segment about Puerto Rican cooking on my favorite radio show, The Splendid Table. Have you listened to The Splendid Table? LOVE! It’s a radio show about all things cooking, and eating, and a bit of travel while eating. Highly recommend. The last episode I listened to featured a woman named Von Diaz, who was born in Puerto Rico, but moved to Atlanta with her family when she was 5 years old. Diaz spoke about the amazing foods that her mother and grandmother would prepare growing up. Her mom being a bit more of a heath nut, and her grandmother cooking much more in the traditional style. 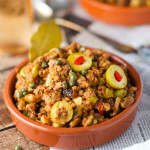 One of the classic dishes that Diaz grew up with, and now makes very often herself, is picadillo, a dish of ground meat that is seasoned with sofrito, olives and raisins. While the traditional version is cooked with beef, her mother would make a healthier version with ground turkey. In their household, the picadillo would always be on hand in a little container in the fridge, much like Americans would keep lunchmeat. I was intrigued. I pictured myself making this dish, eating a bit and stashing it away in the fridge, and snacking on it on a daily basis, while cold, and then making it again and again, week after week, and becoming a little Irish-Italian girl who always has turkey picadillo on hand. So, I started googling recipes for picadillo and found that there are SO many different versions. It was a bit overwhelming. So I put into perspective what I wanted in my version of turkey picadillo. First, I knew that I wanted to use turkey as my base. I like that it is lower in calories and saturated fat than ground beef. Plus, I prefer the lighter flavor of it. Second, I found recipes that had some capers thrown into the mix. I’m a caper fiend… So I included those in my recipe. Fourth – Wine! I had to throw some wine into the mix for good measure. Because… You know… Wine. The result was amazing. Rich, salty, spicy, and a bit sweet thanks to those raisins. Those raisins…. They plump up so magically when they’re simmered in this mixture and absorb all of the wonderful flavors of the dish. They were one of my favorite parts of this turkey picadillo. Turkey Picadillo is a lightened up version of the traditional Latin American dish made with ground beef. This sweet and savory mixture combines briny olives and capers, with sweet golden raisins, black beans and plenty of delicious spices. Serve it over rice or as a taco filling and enjoy! Heat olive oil in a large skillet over medium-high heat. Season the turkey with salt and pepper and cook until browned, breaking it up with a wooden spoon. Drain the turkey and set aside in a bowl. Return the same skillet to the burner, and reduce the heat to medium. Add the onions, bell pepper, garlic and bay leaves. Cook, stirring occasionally, until the onion is softened and translucent. Return the cooked turkey to the skillet, and add the wine, tomato sauce, olives and brine, raisins, black beans, capers, cumin, and cayenne. Simmer for 15 minutes. Season with salt and pepper, to taste. Serve warm with rice, or as a taco stuffing. If you loved this turkey picadillo I would appreciate it so much if you would give this recipe a star review! Also, be sure to snap a picture of your finished dish and share it with me on Instagram using the hashtag #platingsandpairings and tagging me @platingsandpairings. White wines from Burgundy have a medium-body with lightly spicy notes that will pair well with this dish. Rosé is a great partner for this dish – The bright flavors and light acidity match well with the rich flavors in this dish. 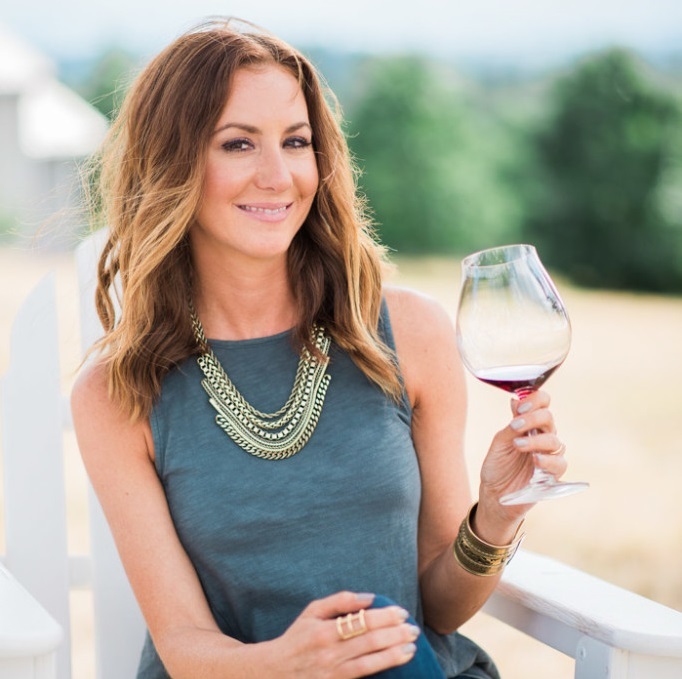 Pinot Noirs from Oregon have a light, bright earthy elegance that will make a great match for this meal. Sparkling wines go well with this picadillo. The bubbles cut through the richness and brighten up the flavors on your tongue. I chose a rosé sparkler to match my meal. Drool worthy photos as usual, even when it’s still in process in the skillet! I am often drawn to recipes that use olives! Well then I think you would love this of course Meredith! I like the Splendid Table, too! How cool it inspired a new recipe. Isn’t it a great radio show?! Love it! I love food blogs articles like this, ones that have a superhero origin story to go along with the recipe. Well done. Put that on a t-shirt, stat. Ha ha – That would make a good T-shirt Geoff! 🙂 I like it! I’m all about the wine pairings Dawne! WOW! What a fun dish to make. It’s a fun, quick, and easy dish to throw together Melissa! I love meals that you can make in under 30 minutes! Oh! Yes! My mom used to make this and I always loved it, but I forgot about it until now. Definitely cooking this soon. Awesome! I wish my mom cooked me Picadillo! This looks delicious! It’s nice to know that Foster Farms has a an organic version of their meats now. I haven’t looked in a while. I’m glad to hear that. I agree – Yep, Foster Farms is organic now! Just look for the light blue label! I LOVE that image of with the steam and the spoon in the background! Life has been a little hactic and stressful lately, and I’ve been really embracing easy meals these days. This looks delicious, and I’m really glad to see that Foster Farms has hopped on the Organic train. Thanks Renée – It’s great to be able to find widely available organic poultry for sure! I hope your life gets less hectic soon! Mmmm, we love turkey picadillo in our house. Now I’m in the mood for some…..
Make some for #TurkeyTuesday tomorrow Melinda! Thanks Heather! I’m a huge fan of ground turkey too – It makes a great swap. Hi. This is one of my fav dishes we make at least twice a month! So thank you! Also, How much do you consider 1 service? 1 cup, 1/2 cup? Hi Kassandra – I am considering 1 cup to be 1 serving. Enjoy!!! Just finished this, delicious!! Great combination of spicy, sweet and salty. Thanks for the recipe! Of course Tracie – I’m glad you enjoyed! My digestive system doesn’t get along with black beans. Could you substitute garbanzos or edamame? Hi Simone – Yes, you could substitute the beans. Or, you could leave them out entirely. It’s such a small amount that they won’t be missed too much. Hi Bre! I have made this recipe with both red and green peppers and think they both taste fantastic. Enjoy! I’m super intrigued by this recipe! my boyfriend is half-Puerto Rican and I’d love to make it for him some time this week. Are capers absolutely necessary for this recipe? I have most of the items at home and I didn’t want to make another trip to the grocery store for them! Hi Kate – You can definitely leave out the capers! No need to head back to the store. I would just add in a bit more of the chopped green olives. Hope that helps! I’d love to hear back on what he thought of the recipe! I made a version of you recipe and loved it. I did not have white wine so I used chicken bone broth. I didn’t have black beans so I used small white cannelloni beans. I didn’t have a red pepper so I used an orange one. I used quinoa instead of rice. It turned out great nonetheless. I love the tang of the olives against the sweet surprise of the raisins. One question: you mention cinnamon in the article but it isn’t in the list of ingredients in the recipe. I can see how it would make a nice addition, but how much do recommend? Hi Louise – I think you could add up to a Tablespoon of cinnamon. Hope that helps!